A tale of two workshops. StoryWeaver visits Mumbai and Mysore. Khyati Datt, a member of our outreach team writes about two of our recent workshops in Mumbai and Mysore. It’s not often that you have 25 Master Teachers from different walks of life, speaking 5 different languages, living in 4 different states and still engaging with each other and sharing their thoughts. 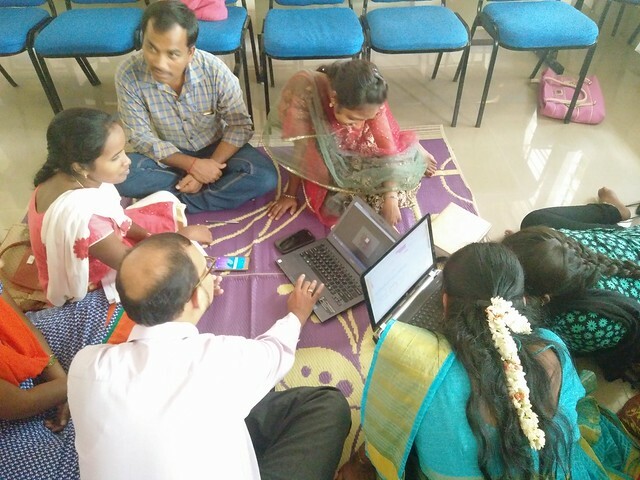 This was the scene at our recently conducted StoryWeaver Workshop in Mysore. Pratham Education Foundation invited their wonderful Master Teachers for a training workshop in Mysore and we, at StoryWeaver, got the chance to interact with them on the last day of their training. Our facilitators, Mala, Shruthi and Payoshni ensured that the session was multilingual- in Kannada, Tamil, Telugu, English and Hindi. The beautiful weather at Mysore served as the perfect setting for a 3-hour long session where interesting teacher practices came to light. As the session progressed, we deep dived into the intriguing world of stories and explored how stories open a child’s eyes to a world filled with joy and learning. The teachers, then, went on to try their hands at StoryWeaver. They decided on themes and explored the platform for five stories/flashcards that talked about their theme. Their biggest takeaway from this exercise was that they can use the platform in their classrooms and combine storytelling with teaching. The second part of their task was getting down to becoming authors! Each group was given a task sheet with a specific theme and encouraged to create a story/flashcard. The most exciting bit was teachers realizing how easy it is for them to create in their regional languages and taking it to their classrooms back home. We got some great stories from the teachers, who presented their idea for the story and the flow behind it. With so many tongues in the room, everyone promptly translated what was being spoken in the room which ensured language was not a barrier for a fantastic session of idea-exchanges. A discussion ensued on what are the different ways in which the teachers can use StoryWeaver in the classrooms. It was wonderful to see how the teachers could align their existing classroom ideas with storytelling practices, like by getting their students excited about a topic by narrating them a story about it. Using illustrations as writing prompts, and spotting books for teaching sight words were one of the many ideas that the teachers dwelled on. We closed the session by showing the participants videos of teachers using StoryWeaver to build a reading culture in their classrooms. The rain shower that followed was the perfect end to a wonderful workshop! A big thank you to Pratham Education Foundation and its ECE wing for giving us the opportunity to interact with the teachers and their consistent support.